LucidLogix announced the availability of its Virtu and Virtu MVP GPU virtualization technologies across more than 100 Intel and AMD based motherboards. LucidLogix® (Lucid), GPU virtualization software leader, today announced that Virtu™ and Virtu MVP™ GPU virtualization product family is now found in more than 100 Intel and AMD motherboard models, setting the standard for improved integrated and discrete GPU utilization, visual quality, power management and system responsiveness. "High quality products and great service are what Asus products are all about. Virtu MVP adds that value across our line of motherboards, allowing users to enjoy best of both Intel graphics on one hand and on the other, enjoy discrete graphics with sharpest images and highest frame rates with MVP's Virtual Vsync," said Joe Hsieh, Asus Corporate Vice President & General Manager Motherboard Business Unit & Desktop System Business Unit. "We understand the importance of a responsive immersive gaming experience and with Virtu MVP's HyperFormance, we are able to provide that for the majority of popular PC titles." Lucid Virtual Vsync™ allows systems to run games free from tearing artifacts, like standard in-game frame synch (also known as Vertical Sync), but this time without slowing down the game experience and frame rates. 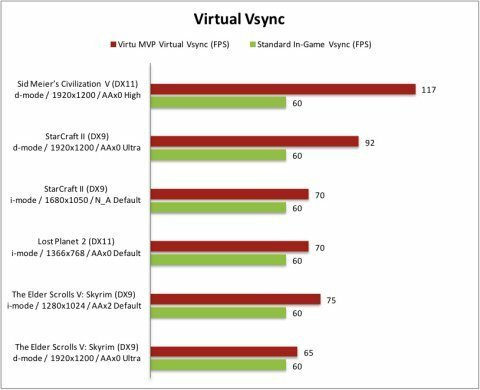 Traditionally, games running Vsync for tear artifact removal often reduce performance by up to 50 percent. Basically, Virtual Vsync eliminates the need to trade off performance for visual quality. "Lucid Virtu MVP adds significant value to GIGABYTE gaming level motherboards through improved responsiveness, power saving and performance," commented Henry Kao, Vice President of GIGABYTE Motherboard Business Unit. "Gaming PCs are a major driver for our retail motherboard business, and we welcome partners, such as Lucid, to continue to innovate for the desktop PC market in order to ensure that our customers are ahead of the curve when it comes to the latest technologies and features." For example, the Lucid-generated Virtual Vsync Chart demonstrates the Vsync performance improvement of some games when comparing Virtu MVP’s Virtual Vsync to standard in game Vsync, which is capped at 60 frames per second (FPS) by vast majority of displays, in a variety of i-Mode and d-Mode settings. The findings show that Virtual Vsync can nearly double the FPS, resulting in a smoother gaming experience, while eliminating image tearing and artifacts. Furthermore, Lucid Virtu MVP features HyperFormance™, a technology that enables further increases in system responsiveness not only above in-game Vsync, but also above native performance. The Lucid generated Virtual Vsync & HyperFormance Chart demonstrates a 158 percent system responsiveness increase beyond native performance, and 260 percent above standard Vsync. Lucid Virtu MVP can be found in motherboards by all of the leading manufacturers including Asustek, ASRock, Gigabyte, MSI and others. Many more motherboard models are expected to launch in the following weeks. For a complete list of where to find Lucid Virtu MVP visit: http://www.lucidlogix.com/mvp-product-list.html.